CCS switched off temporarily. The stored speed is shown in small numbers or displayed in a darker shade. System fault. Proceed to a qualified workshop. CCS switched on. Speed memory is empty. CCS is active. Stored speed in large figures. CCS or the speed limiter is controlling the speed. If the CCS, ACC or speed limiter were switched on when the ignition was switched off, the CCS or ACC will be switched on automatically the next time the ignition is switched on. However, no speed is stored. The speed limiter's last set speed remains stored. 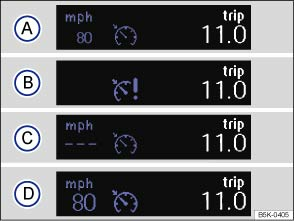 Displays can vary as different versions of the instrument cluster are available.